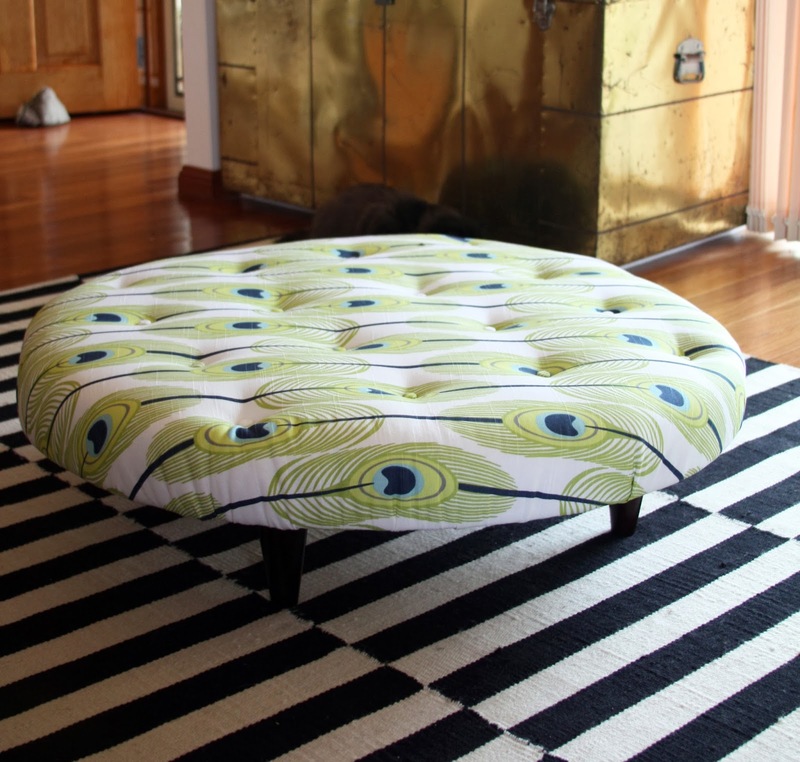 I have been lusting after a number of tufted items recently. 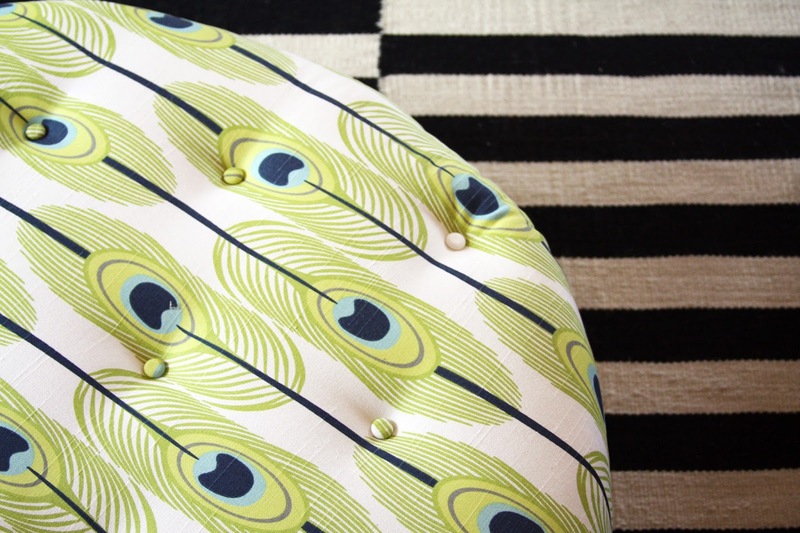 Tufted ottomans, chairs, bedheads. If it has a button on it, I have lusted after it. I am making a tufted bed head soon so thought I would start on a smaller project to have a bit of a practice go. 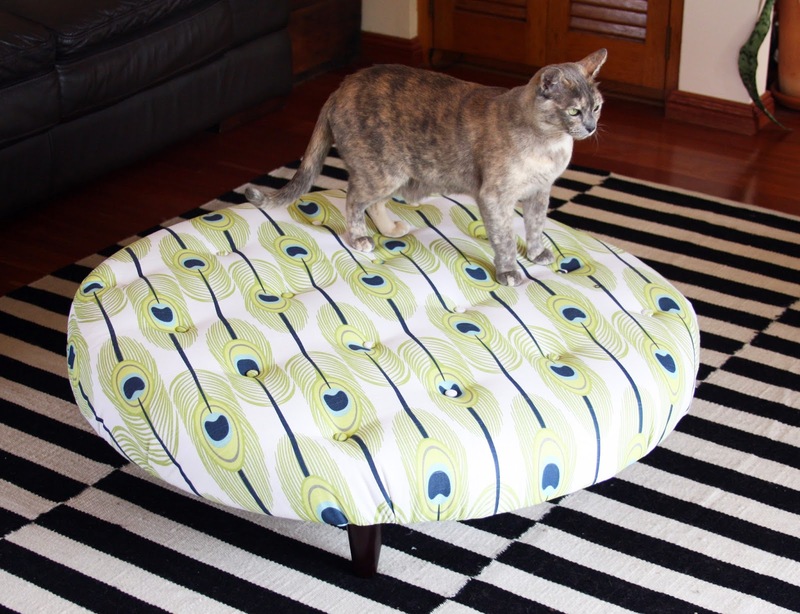 There are a heap of tutorials online for ottomans that reuse coffee tables and the like, I was more interested in a larger, rounder, close to the floor version (this week anyway). 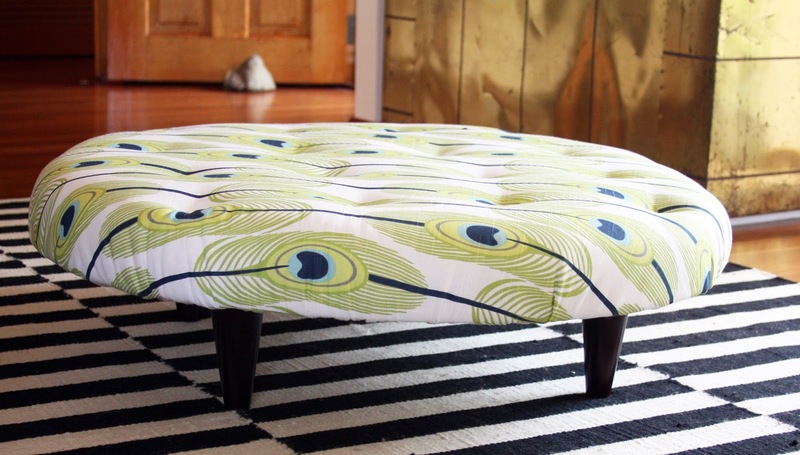 I couldn't really find any comprehensive tutorials about making an ottoman from scratch so I thought I would add my contribution to the mix! Disclaimer: as this piece is so low to the floor and doesn't have a heap of framing / reinforcement, I wouldn't use this for seating (except maybe for littlies). First step, find someone with a large car or trailer to help you get a sheet of ply. 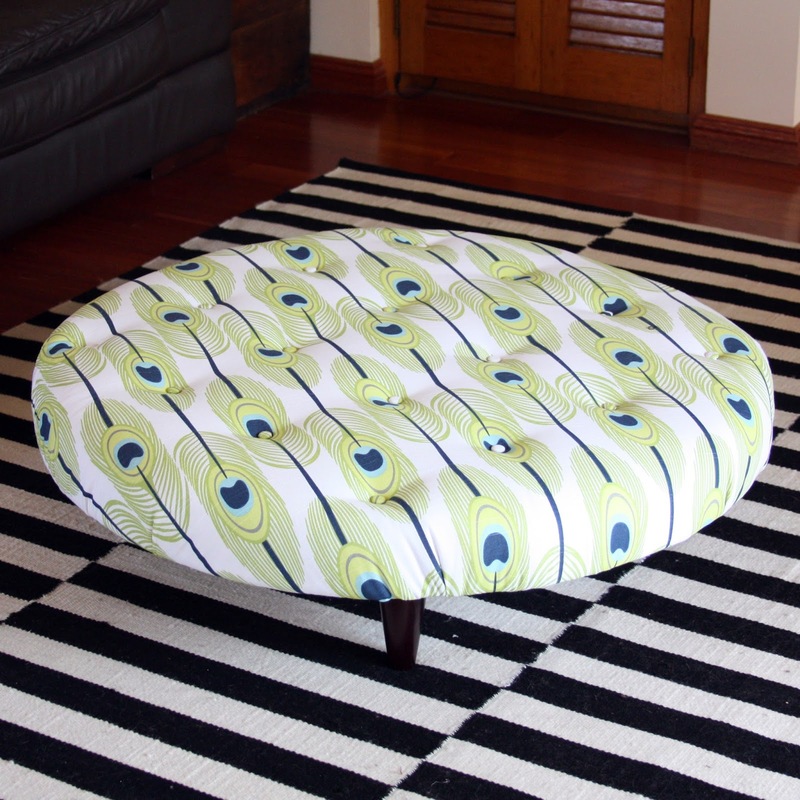 My ottoman was around 800mm diameter, but you can change this to your own preference. The ply I got was 15mm thick. To create the circle draw a 800 x 800mm square on the ply. Find the middle point of this square i.e. measure up 400mm each side and draw line across so lines intersect at centre, This intersection is the middle. Tap a nail into this intersection, lightly, as it will be removed later. Knot a piece of string around nail, measure 400mm from nail to end of string, wrap extra string around pencil and make sure string length measures 400mm once wrapped. Rotate string around nail to create circle. This circle is never going to be 1 billion percent perfection, as your hand is changing angles. I found this method was fine for my needs though. Cut circle shape out with a jigsaw. Place circle of ply atop foam (I used foam that was medium density and approximately 6cm thick). Trace around circle with a marker. If the width of the foam is less than the diameter of the circle, patch up edges with extra foam as needed. Now to drill holes for the button tufting. I decided to do a 4 x 4 pattern (16 buttons in total). I measured them out evenly from the centre point that I had nailed in the ply and then drilled through. At this point, I made a frame for the bottom as was going to use some different feet, I decided to remove it when covering though. Place batting on the floor and place foam and ply on top. Tuck each edge of batting up and staple (whilst pulling firmly on the batting) and staple where north, south, east and west would be. Starting on one quarter, pull batting up and fasten with staple, pulling batting tight as you do so. Once batting is secured all the way around, trim off excess. Iron fabric that you are using and place on clean surface and fasten with staples like you did the batting. The circular shape can be a bit difficult to staple down and you may find that you need to add a pleat every now and then. Attach feet plates (I used the Leggz brand of legs and plates from Bunnings). Now for the tufting! There are many tufting examples out there that explain the process a lot better than I ever could. Getting a long upholstery needle with make the whole process a lot less painful. Insert long needle up through tufting hole, thread through button and then thread back down through foam and out through same hole. Once both threads are out the bottom of the ply, staple gun in a haphazard pattern until the thread doesn't budge. Complete this with all tufts, making sure to check that the tuft depths are the same when you staple the threads. I decided to neaten the bottom with some hessian. I just folded the edges under an stapled. I then found the feet plates and made a small hole on the hessian for the feet threads to screw into the feet plates. AND DONE. I just need to Scotchguard it so sticky little fingers (or paws) get to it! Not quite sure about furniture placement now either . . . I think a rearrangement is in order.